Add the butter and brown sugar to the bowl of a 4-6 quart slow-cooker. Spread each slice of bread with a layer of dulce de leche. Sprinkle each piece of bread with chopped pecans and then arrange the bread slices in your slow-cooker. In a bowl, whisk together the milk, eggs, vanilla, cinnamon and salt. Pour the milk/egg mixture over the bread slices. Make sure all of the bread has been moistened. Sprinkle the pecans over the bread. Cover and place in the fridge for 30 minutes or up to overnight. The next morning, turn the slow-cooker to Low and cook for 3 hours, or on High for 1 1/2 hours or until the bread is cooked through and golden brown. 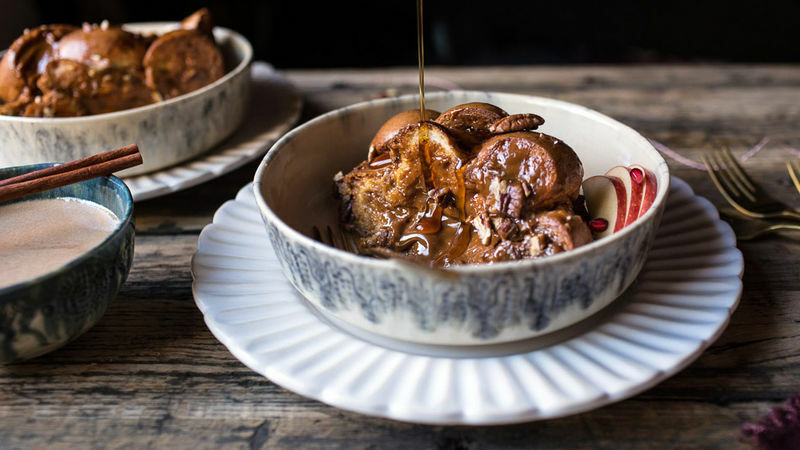 Serve warm with caramel sauce, dulce de leche or maple syrup. Enjoy! If you don't have a slow cooker, this can be baked in a casserole dish at 350ºF for 30-40 minutes or until cooked through and golden brown. For a fun flavour switch up, try replacing the dulce de leche with peanut butter or Nutella™.